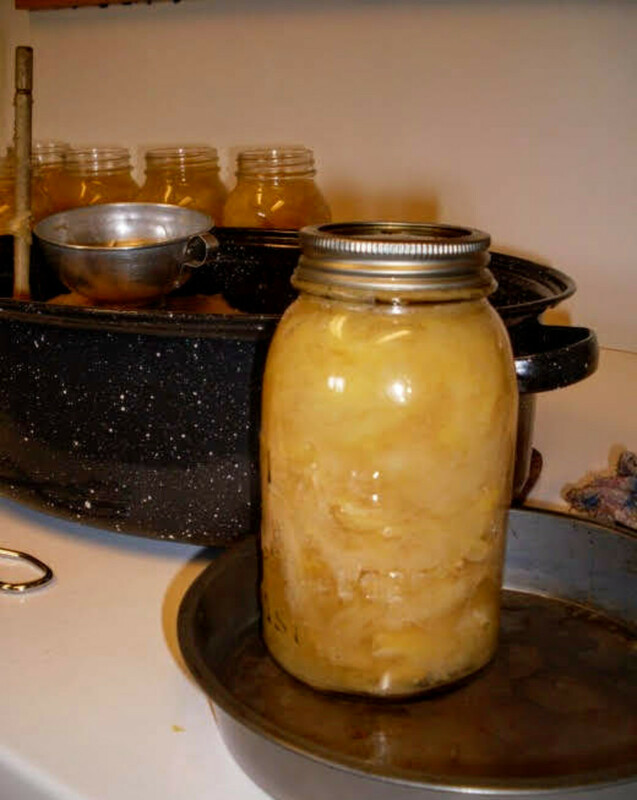 Pressure Canning Is A Good Answer To Hoards Of Squash! Winter squashes are one of my favorite parts of fall. I am anxious over their growth periods each spring and summer, doing my best to deter the hordes of hungry grasshoppers, and the occasional pecking chicken in my garden. I invest many prayers asking that they mature before the first hard freeze. Then, when at last their golden and orange and buff and spotted and streaked rinds adorn my table and cellar, I breathe many prayers of thanksgiving, and begin to work out my plans for them. There are pumpkin pies to make, and butternut squash custards with nuts on top to bake, and halved acorn squashes, with their insides running with butter and dotted with black pepper, to set before my appreciative husband. There are cookies and muffins and pancakes and, yes, even pumpkin ice cream to look forward to. I often have a cellarful of squashes when the first heavy snows fly. But around February, the squashes begin to lose their keeping qualities. Nobody wants to be served a spaghetti squash that looks like it has the measles. So what is the answer? 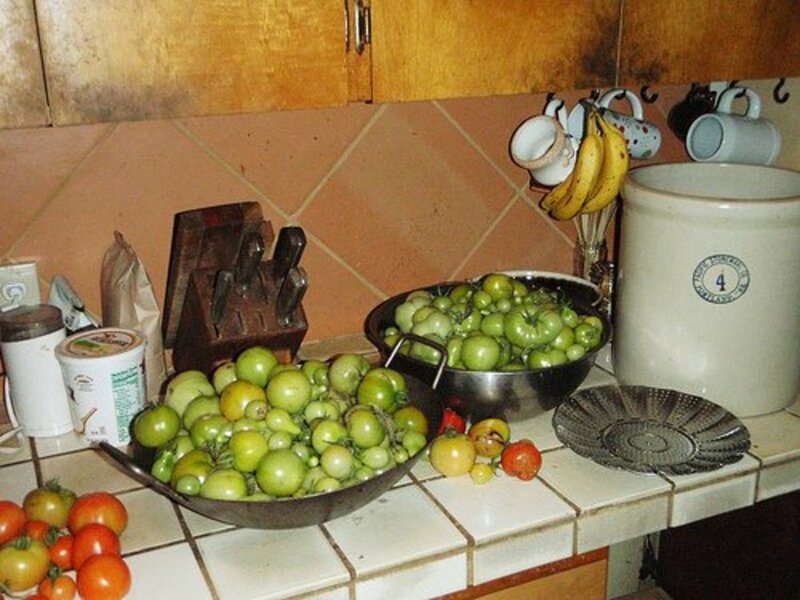 You're not supposed to dry winter squash, nor pumpkins. Why? I don't know yet, but I suppose it has something to do with bacteria which may spoil the squash and hurt you. Freezing is an alright answer, but bags of puree take up so much space. So my answer is canning. 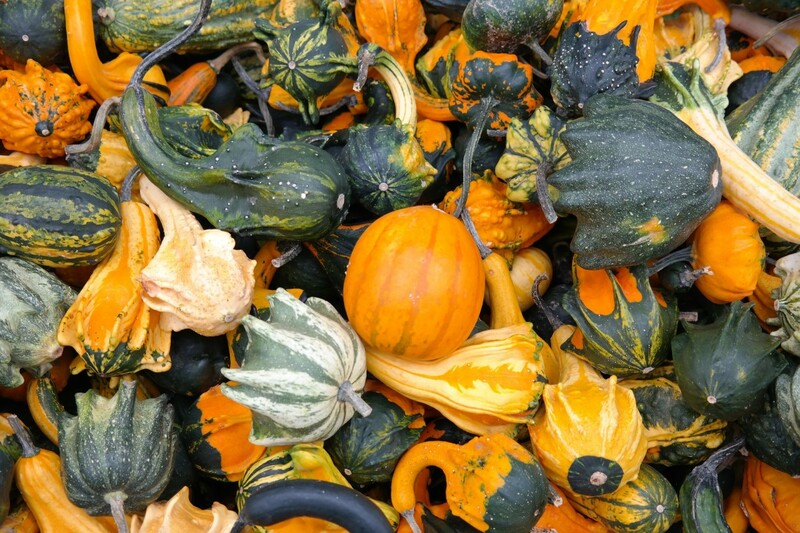 Which Kinds of Squashes Are Eligible For Canning? Almost any squash can be canned. 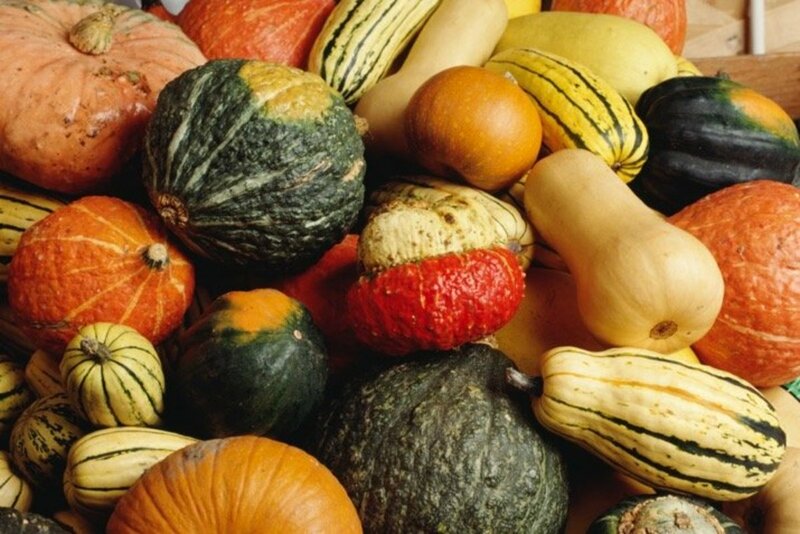 However, all squashes are low-acid foods, so must be processed using a pressure canner or pressure cooker. Even summer squash varieties can be canned, and very large or overly mature summer squashes should be processed just like winter squashes. 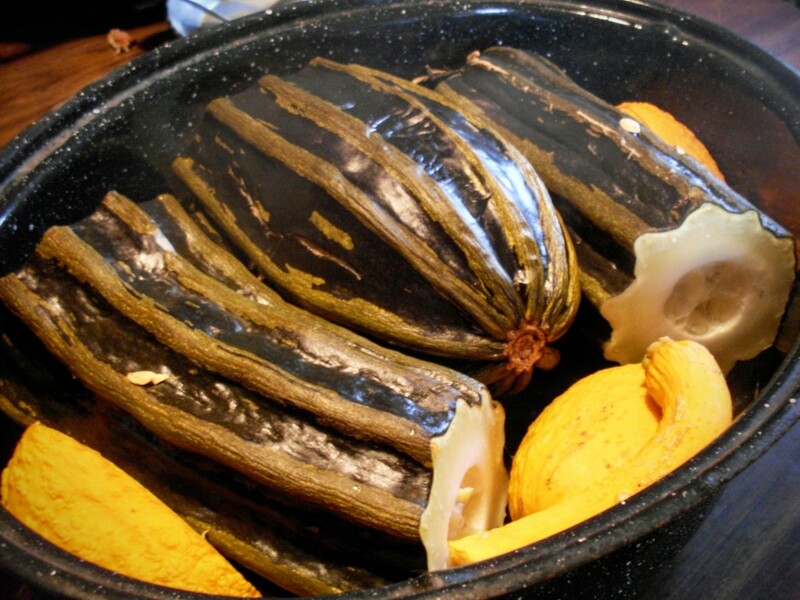 Large squashes must be cut apart before stewing or roasting, due to their size. 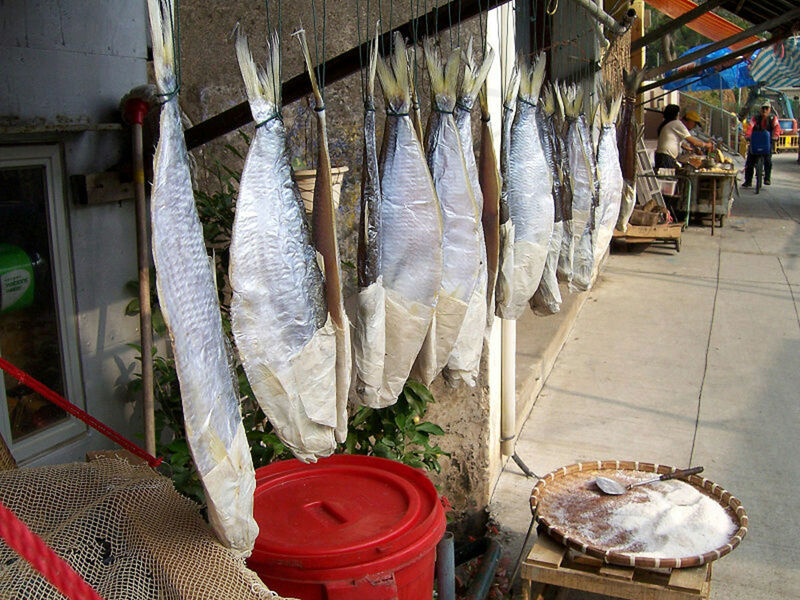 Smaller ones may be roasted whole. 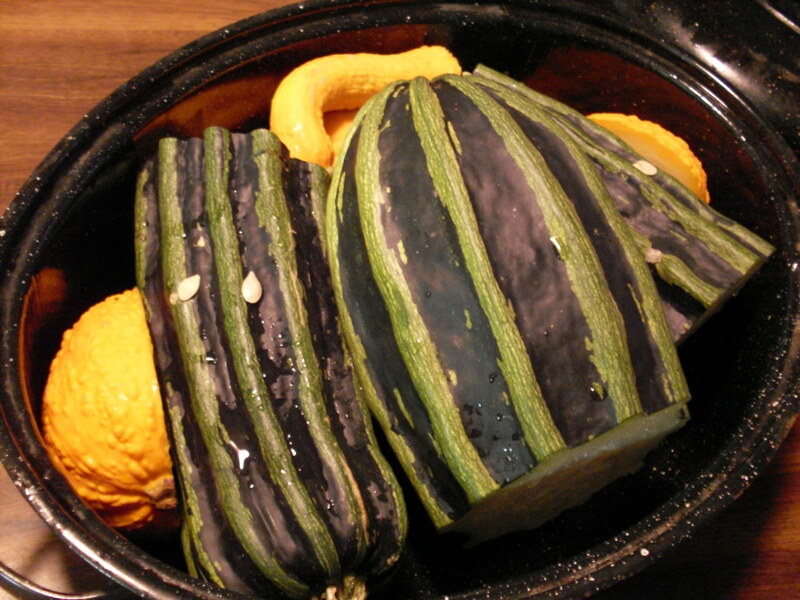 Place only a small amount of water in the bottom of the roaster or pot, as the squashes will give off their own liquid. 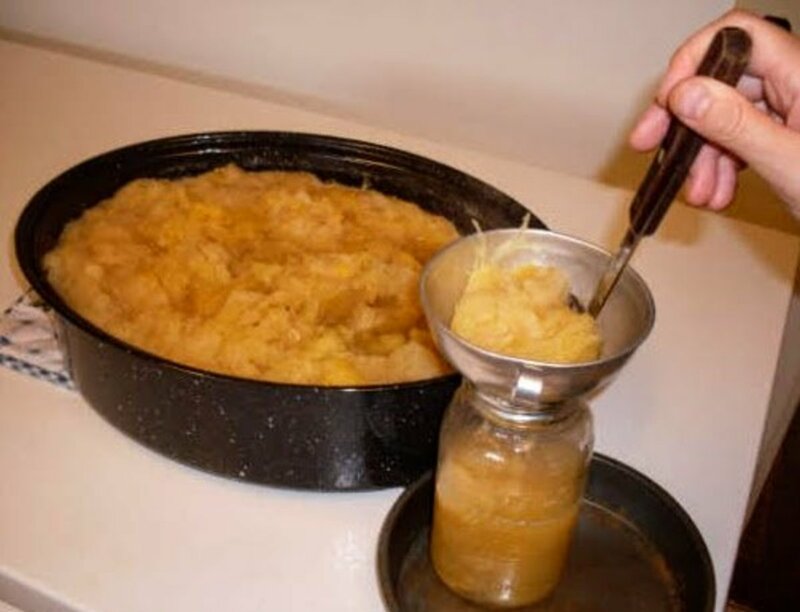 If you have many squashes to bake, change the water every batch or two, especially with pumpkins, which seem to do a good job of cleaning water lime and other residues from the bottoms of pans. 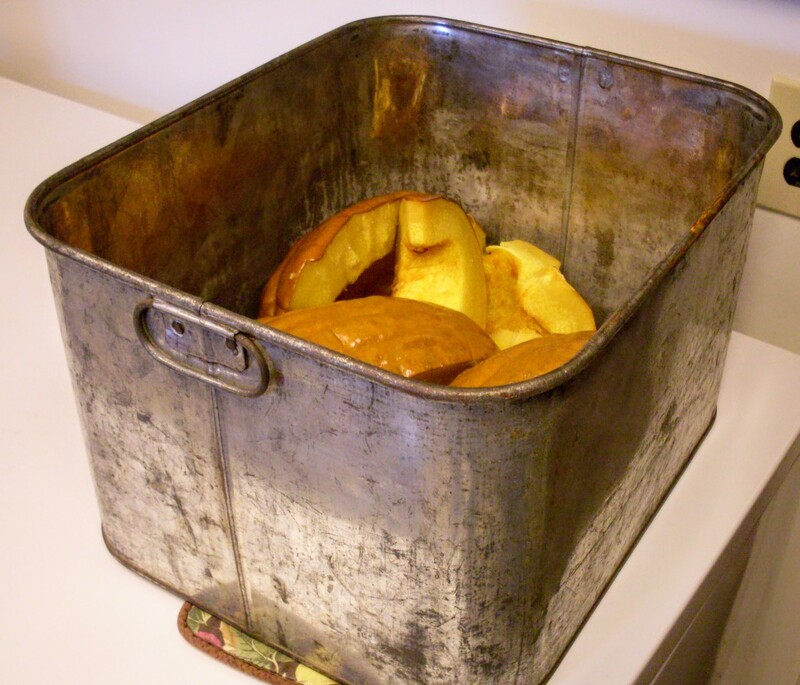 I had a batch of pumpkin nearly ruined when they helped bake some hard-water residue off the bottom of an ancient roaster which was not coated with enamel. 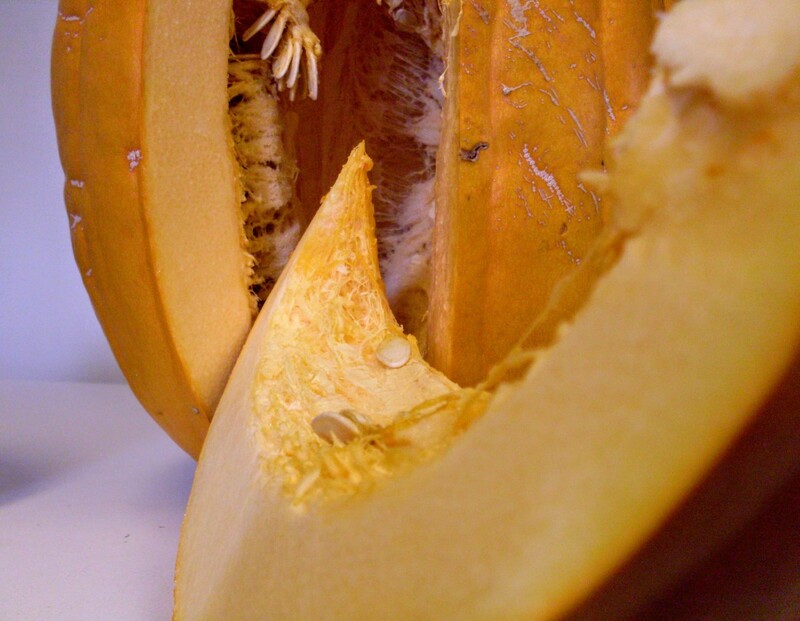 The murky water infiltrated the pumpkin flesh, giving it a metallic tang and making it almost inedible. I labeled this batch for the German Shepherd dog, who seems to enjoy pumpkin, and ate it mixed with meats and other veggies. 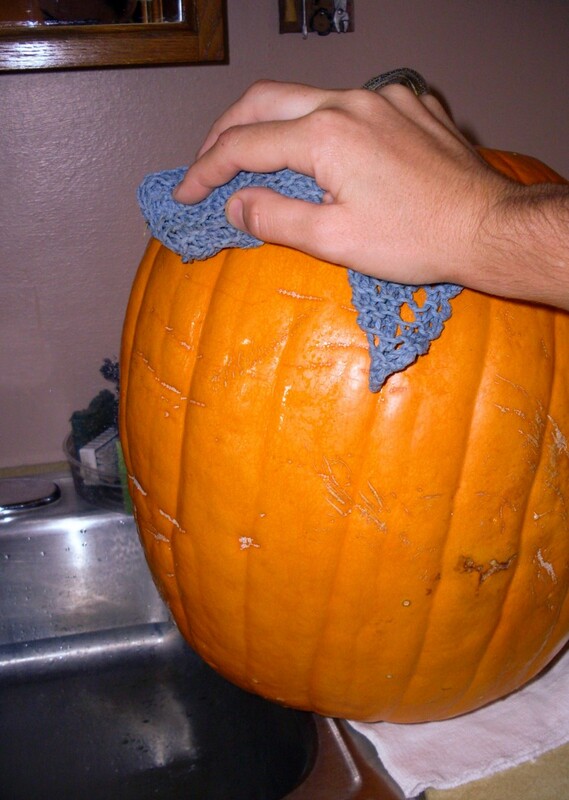 Wash the squashes or pumpkins with a nice scrubbing cloth and tap water. You may use a bit of soap if they are filthy; rinse thoroughly. 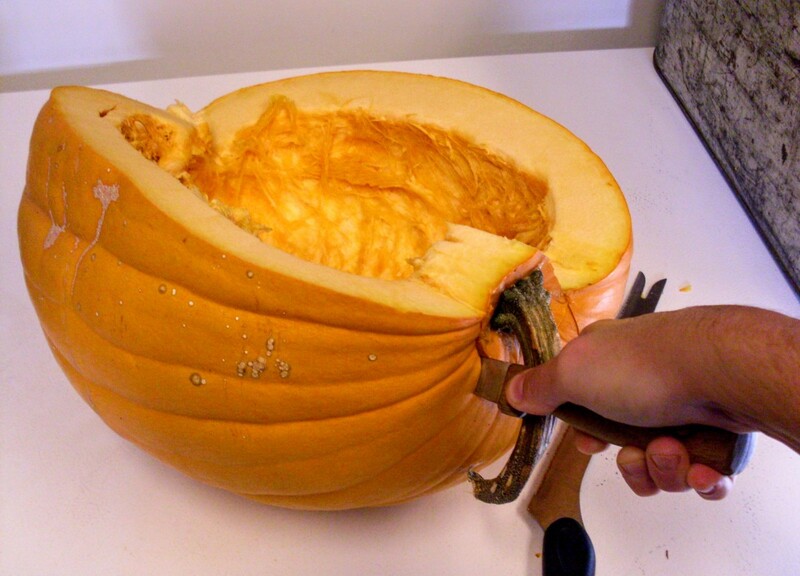 Begin by cutting a slit in the pumpkin near the stem. You may have to stab hard. Make sure your knife is very sharp. 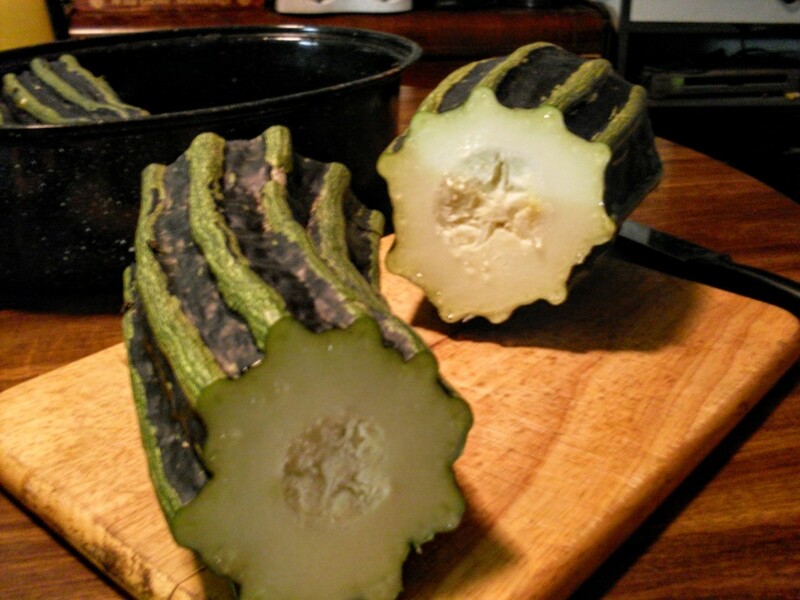 Then cut around the stem, making a series of straight cuts, or whatever seems easiest. Be safe! 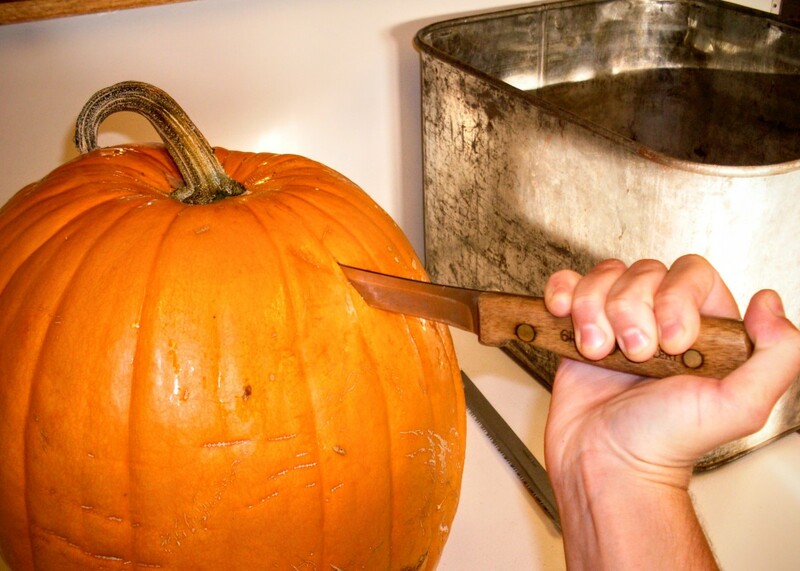 ...to cut neat wedges of golden pumpkin. Pause to admire the beautiful, golden cave all hung with roastable seeds. 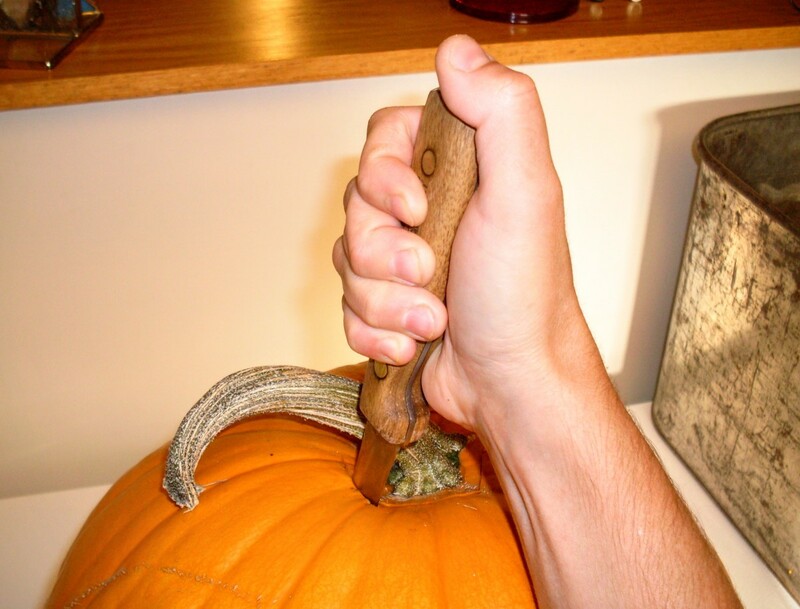 The more wedges you cut, the harder it may be to hold your pumpkin still. Engage another pair of hands if necessary. Scrape seeds into a waiting bowl as you complete each slice, but don't bother yet with "strings". Pumpkin, cut into sections for baking. 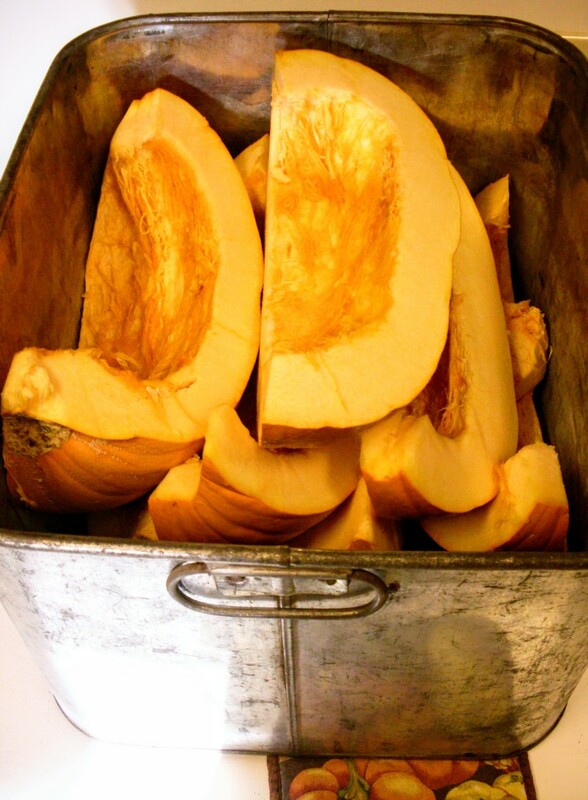 You may also stew pumpkin, using a small amount of water in the bottom of a large pot. Spaghetti squash already baked and with the rind and seeds removed. 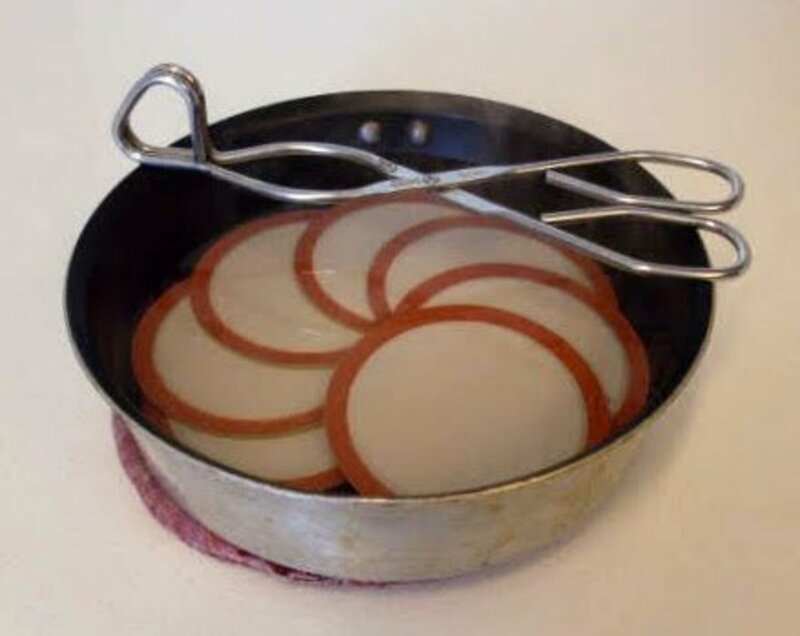 ...and bake until tender when pierced with a fork to the center. 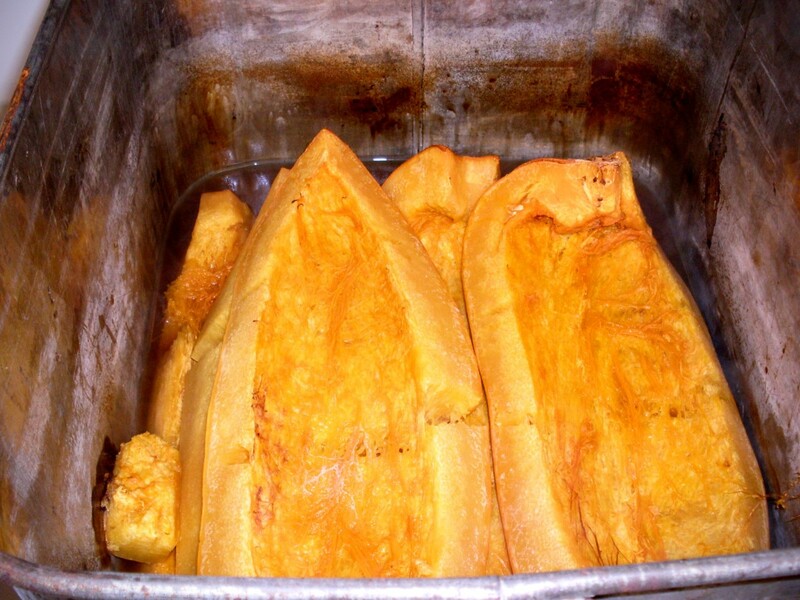 Large pumpkins or squashes are best baked in the largest roaster you can find, as they require 1 1/2 to 2 hours to become soft. 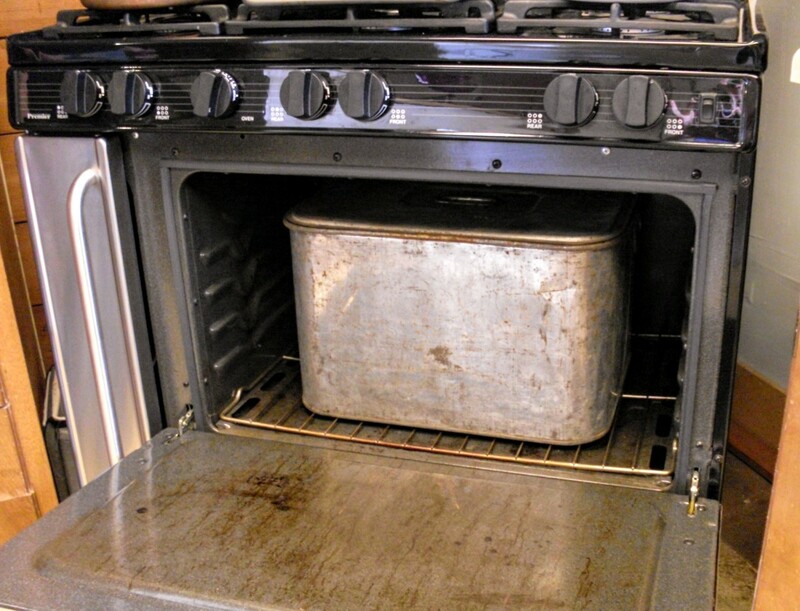 This "roaster" is really an antique cookstove-top canner, designed to can 12 quarts at a time. It is aluminum, and will leach a funny taste to pumpkin which is left in it...so remove promptly. The pumpkin has cooked down nicely. 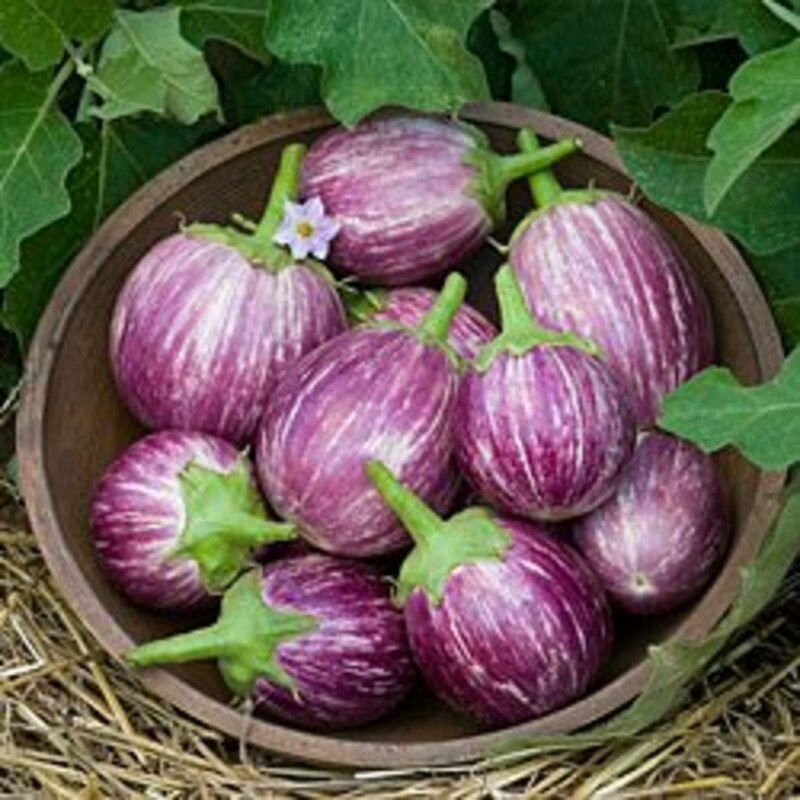 It is easy to remove the "strings" and any stray seeds now. Cool the squash at least an hour before handling, unless you like steam burns. 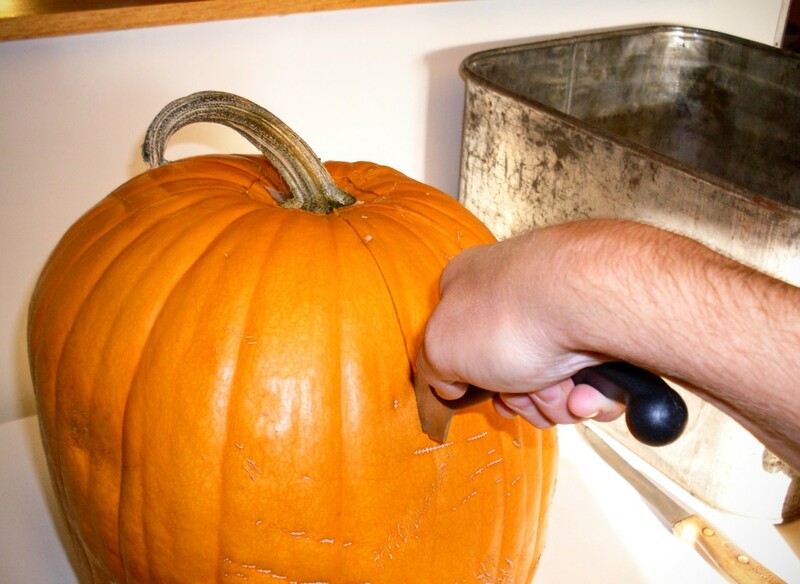 To remove pulp from pumpkins, use your thumb to scrape small sections from the rind. Bits of rind in the pulp can be picked out later, when you pack your jars. 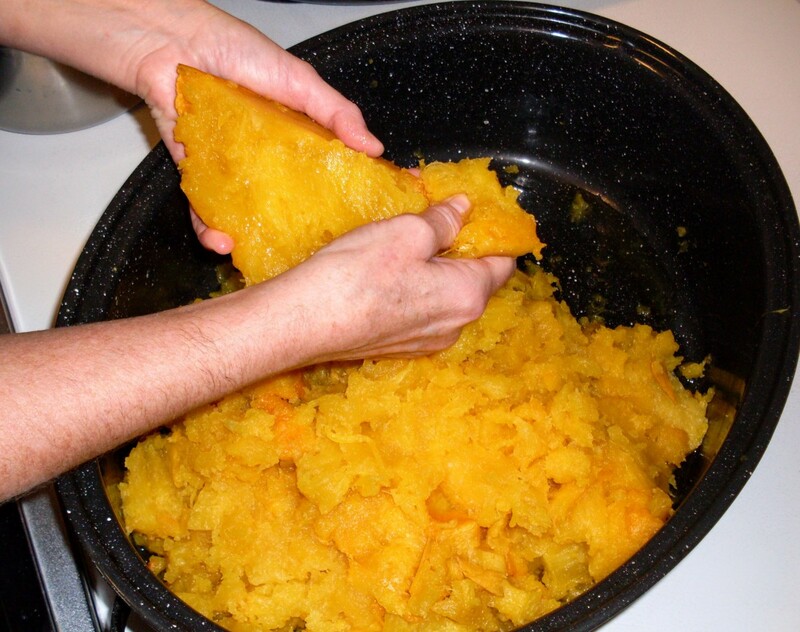 If you cannot process all the pumpkin or squash in one day, bake it one day, cool it, then place the pulp in a roaster to re-heat before packing into jars. Wash (sterilize if necessary) and examine all jars (chips, cracks), rings (bent, excessive rust), and lids (misaligned rubber). Either gently simmer the lids (don't boil! ), or set them in a small pan and pour on boiling water to cover, to scald them. Pour into your pressure canner the recommended amount of water (usually 2 quarts), and begin heating it. 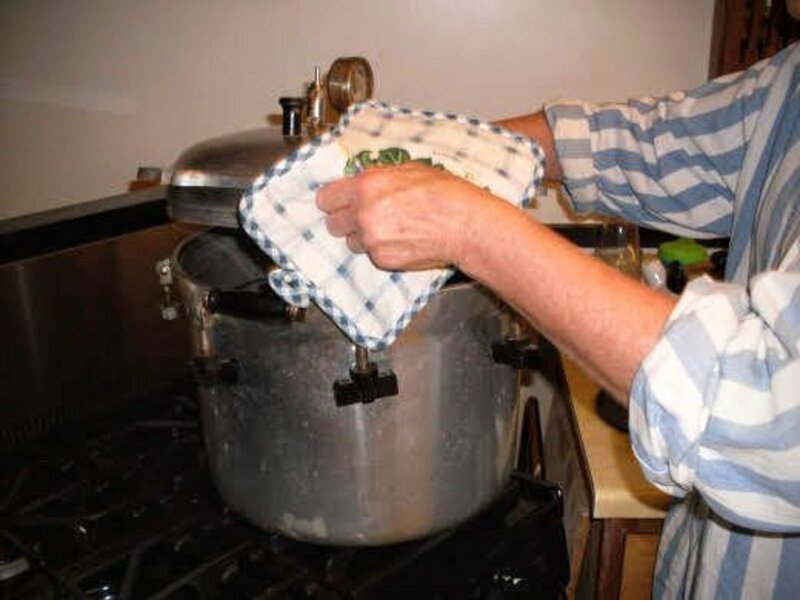 Add a splash of vinegar, to avoid hard water stains on your canner and jars. Some squashes can be ladled into a canning funnel, others are better spooned in. Spaghetti squash ladles easily. Use a wooden spoon handle to help any thick parts go down. Fill to within 1/2" of the top. 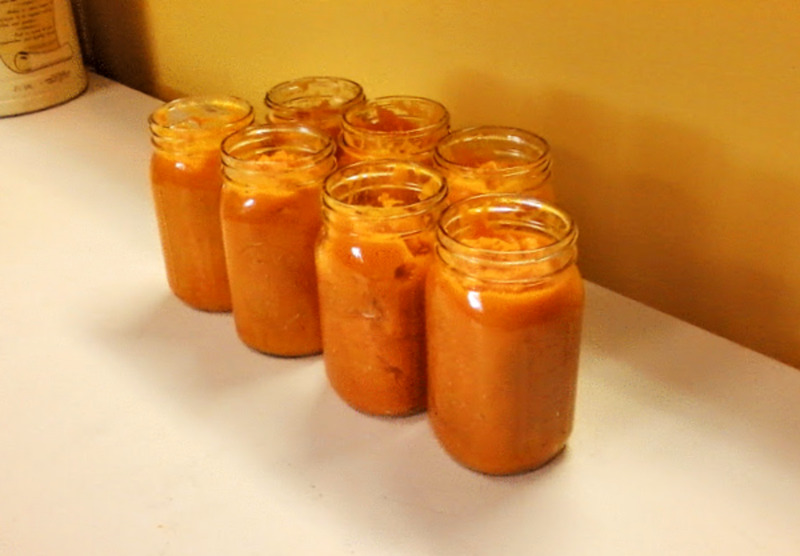 Pumpkin must be tamped down to remove air bubbles, and to best fill each jar. Tamp it well when your jar is about half full, again when it is two-thirds full, and then spoon in more pulp, to within 1/2" of top. Tamp again. 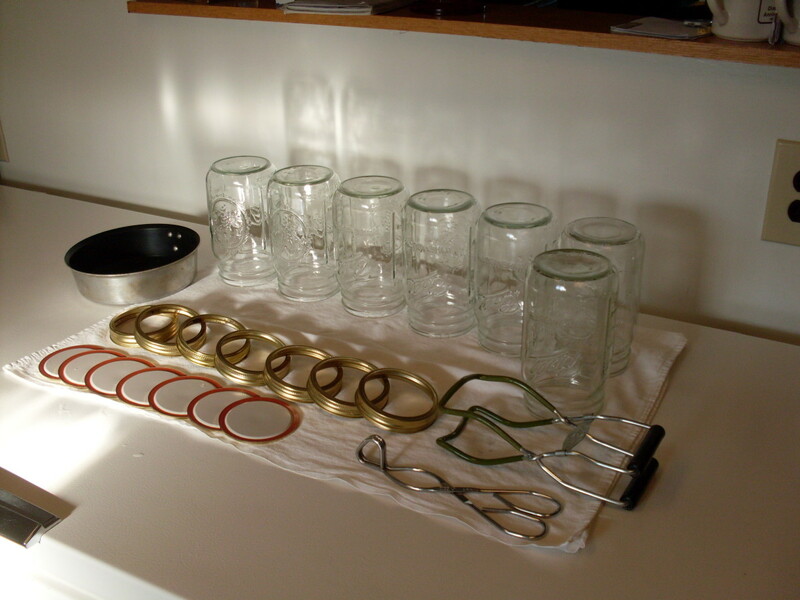 Wipe the rim of each jar with a clean, damp cloth, then screw on lids firmly (but not tightly). A well-filled jar. Some squash pulps cook down (dry out) some during processing. Pumpkin packed, ready for lids. This variety of pumpkin is a soft, sweet, but complex type which holds its color well after processing. It is called Mr. Pugly. Place jars in canner rack. Screw or fasten lid in place. 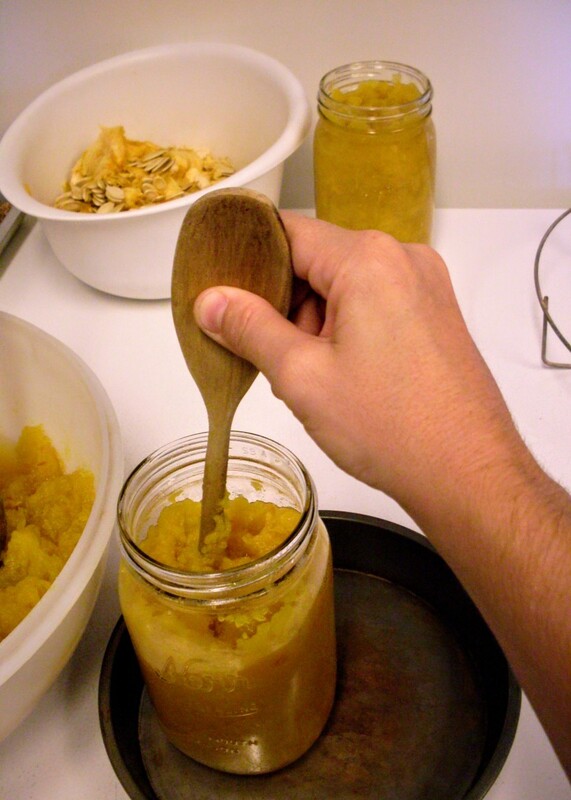 On old-style canners, screw knobs down tightly in opposites, to achieve an even seal. Heat on low/medium heat until the steam vent is hissing and spitting, then wait 10 minutes to place the weight for 10 lbs. pressure. Waiting ensures the canner is properly pressurized. Process 80 minutes, then turn off heat and cool completely. DO NOT REMOVE WEIGHT YET. 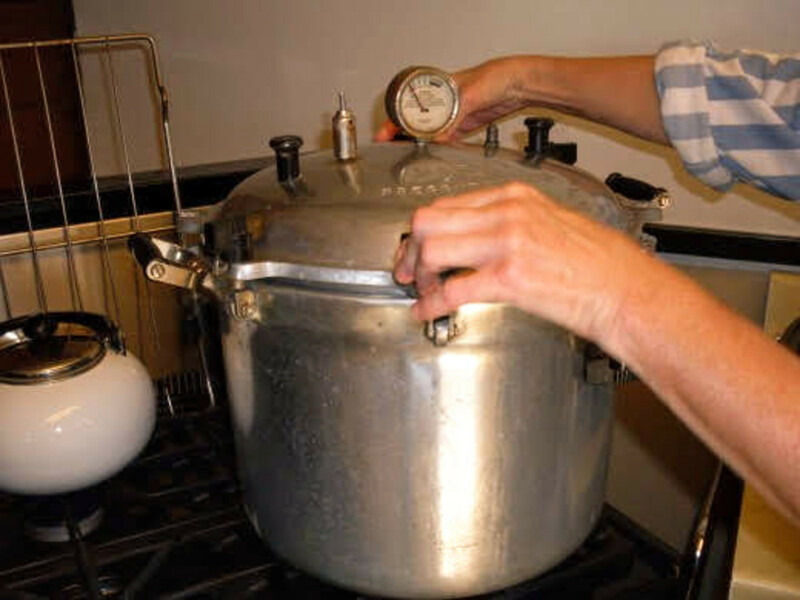 Once the pressure gauge has returned to zero pounds, carefully remove the weight and lid of your canner. Unscrew knobs in opposites, just like you tightened them. 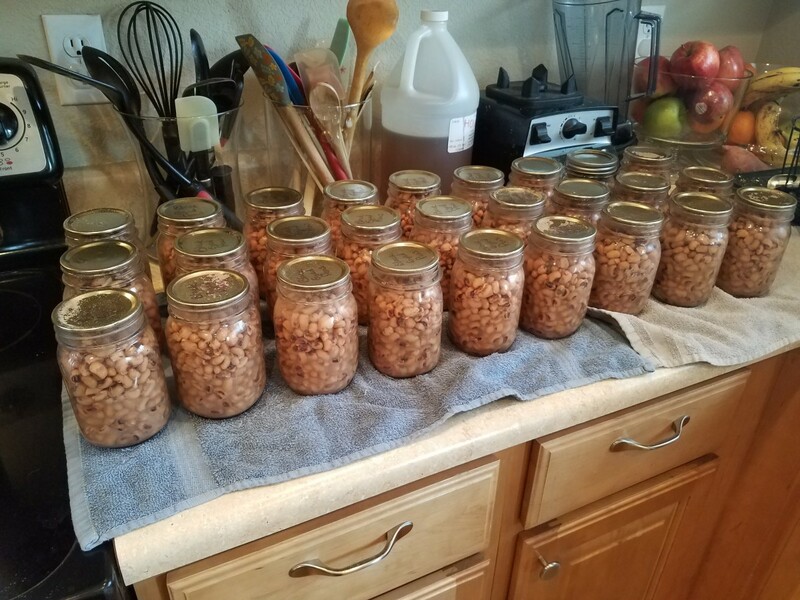 Lift each jar out carefully with a jar lifter. 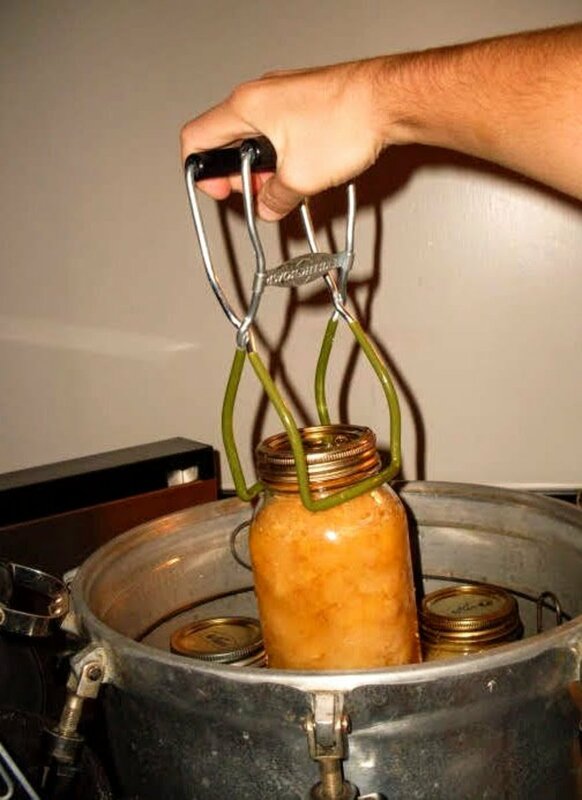 If you have waited for the canner to cool sufficiently, you should be able to remove the jars promptly. Finished spaghetti squash. Place jars on a towel away from drafts, to cool overnight. Lids will "ping" as they cool and seal. Finished pumpkin. When completely cool, check that all lids sealed properly (there should be no give), and then gently wash any residue off jars before storing in a cool place. In the comments at the end of this article, there is a discussion on the merits of cubing squash for canning, instead of puréeing it. The reasons are simple and scientifically sound: puréed squash does not heat up as well as cubed squash, nor as evenly. 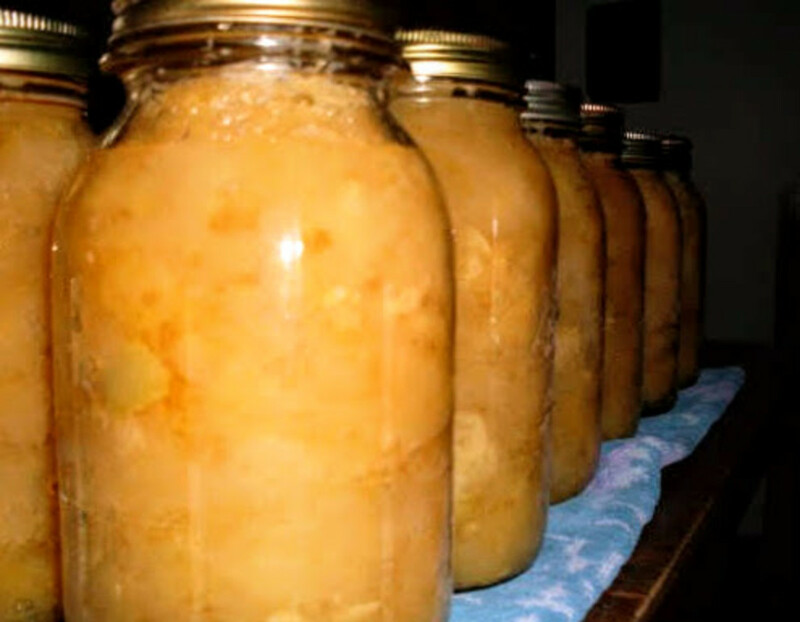 This means that while being canned, each jar of squash (especially in quarts) may not heat up sufficiently to the very center, to kill all unlovely bacteria. This will, of course, invite spoilage of your product, and possibly illness for you and your loved ones. I, personally, have never had a bad experience with puréed squash...but if the risks are ones you will not take, then by all means, cube your raw squash, pack it in jars, and fill to within a 1/2" of the rim with boiling water. Your squash will be soggy, but safe. An easy guide to cook pumpkin puree at home. Once you go fresh, you'll never go back. This is a good-tasting soup for winter that will make you feel warm and satisfied with good food. 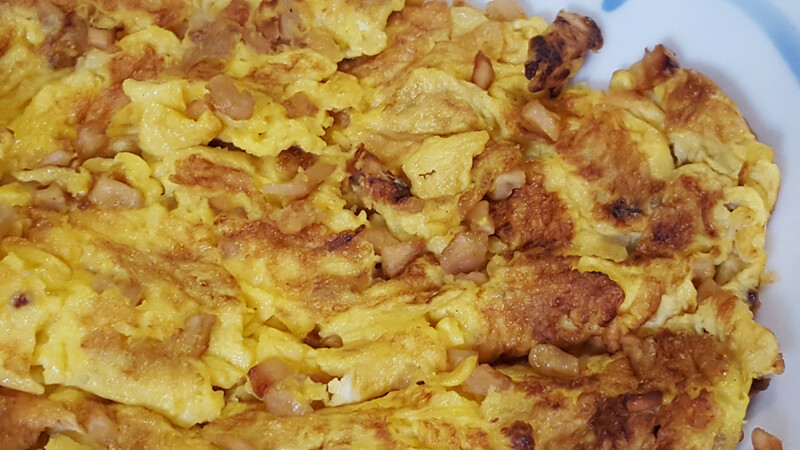 This recipe can be made with other forms of delicious squash as well. Video recipes included. 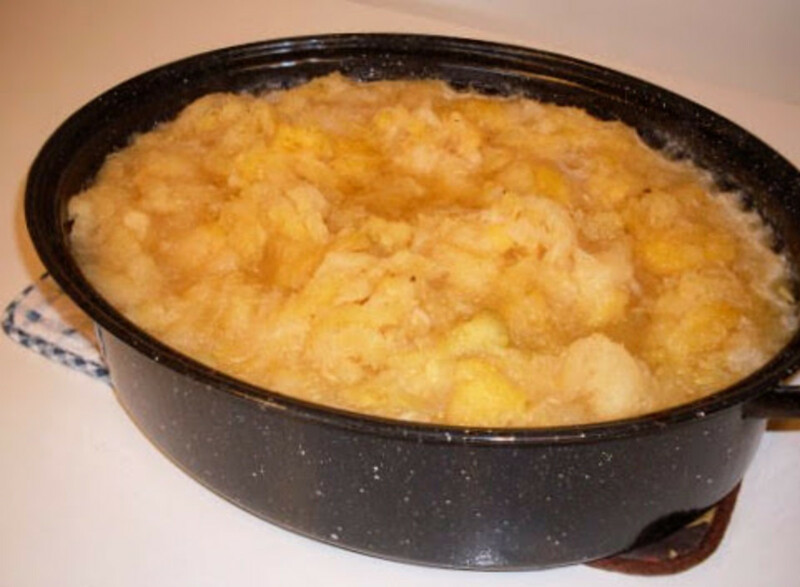 When cooking spaghetti squash with butter and brown sugar, is it okay to can? Coral, this sounds like a great idea, except that, because squash is a low-acid food, you would be much safer to process this mixture in a pressure canner. The tomatoes may or may not have enough natural acid to allow them to be safely canned with a water bath method, but squash does not. I would follow the usual recipe for plain squash (which I have done before with spaghetti squash, and it comes out fine). 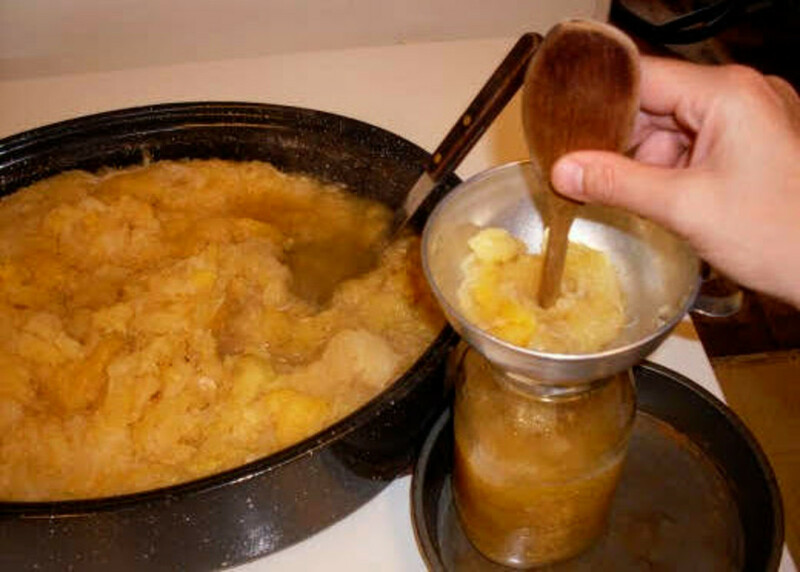 You may have some excess liquid to simmer off (taking only a few minutes), when you open your jars of squash, but this should not be a big deal. You are right that having a meal in a jar is a big help, and this sounds like a good idea, even though I have never tried canning the squash and tomato sauce together. (I don't care for spaghetti squash that much!) If your mixture includes any meat, you'll want to process it in a pressure canner for 90 minutes. I was thinking of doing a vegetarian tomato sauce and putting the spaghetti squah in it, all cooked and then doing in a water bath . Would be nice to come home and open a jar and bake it up with some cheese . Would appreciate your thoughts . There would be no mushrooms either. Thanks for the information. This makes sense. I am so sorry I missed your comment! I don't know how this happened. Anyhow, I don't usually can summer squash...it gets a yucky texture. I tried zucchini once, and had trouble finding ways to use it. (Don't actually remember what I finally did with it...maybe fed it to the chickens.) I often dry my summer squashes and zucchinis, either sliced or shredded, and in this form they can be reconstituted and used in many of the same ways you would use fresh squash. how do eat your zuchs or yellow squash after they are canned? Just as a side dish or is this more for pies and breads? Simone, thanks for the info. But I guess if a squash has botulism, it's going to have it whether it's pureed, or not. Leaving it in cubes isn't going to prevent botulism. 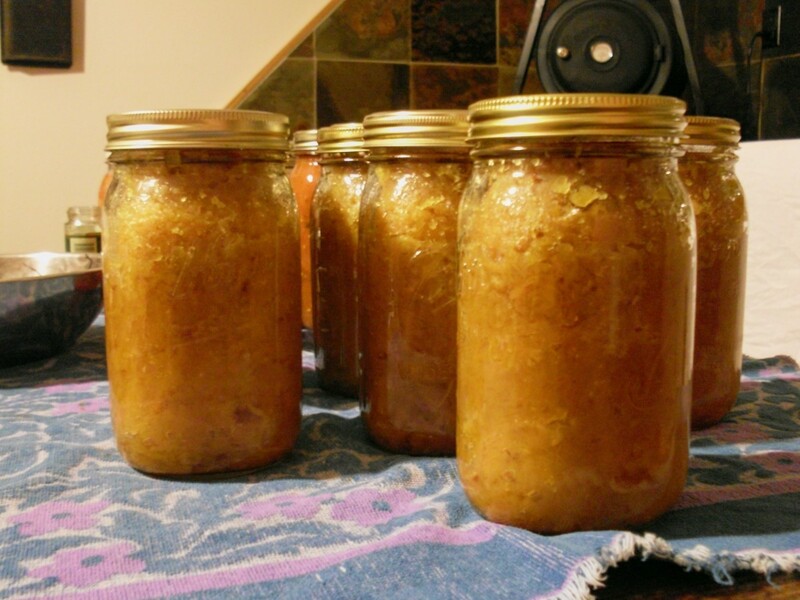 So I'll keep canning my squash - a procedure that has been engaged in with safe results for many, many years - and, when possible, eat my squashes straight from my garden, along with other foods that haven't been completely destroyed by all manner of processing deemed "safe" by the powers that be. I'll save my freezer room for things like a side of home-grown beef. Hi, Good page and nice to see someone else who cans Squash. However, I do not puree the squash unless I freeze it, to Dangerous. Here is why, http://nchfp.uga.edu/publications/uga/pumpkin_butt... . This process was fabulous; exactly what I was looking for today. I have only one huge pumpkin but I'm headed to the kitchen to make baked pumpkin for pies. 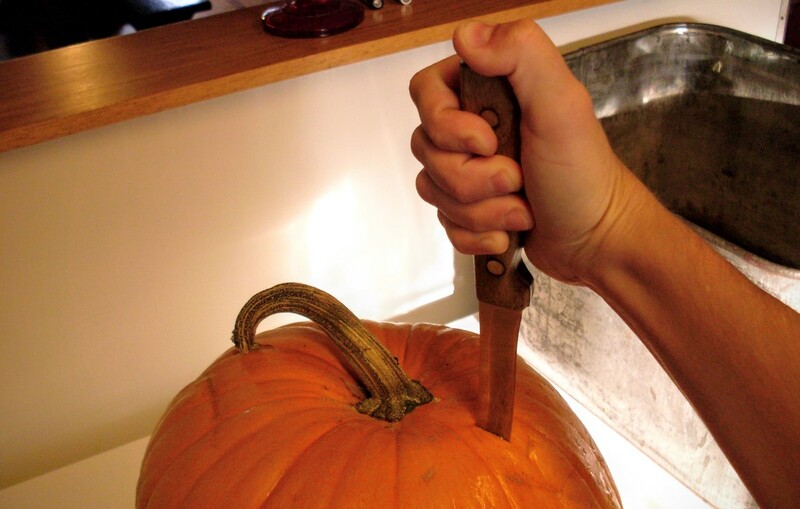 Thank you so much for the great pictures and explanation of how to cut open the pumpkin. Monica, so sorry for missing your comment - my internet access is very limited at this time. 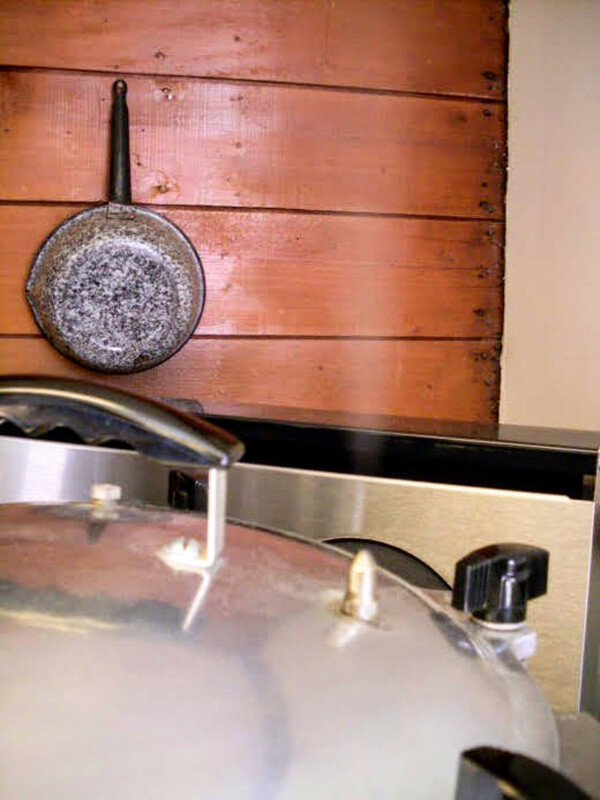 Thank you for pointing out my error in terminology on the article - pressure canner vs. cooker. 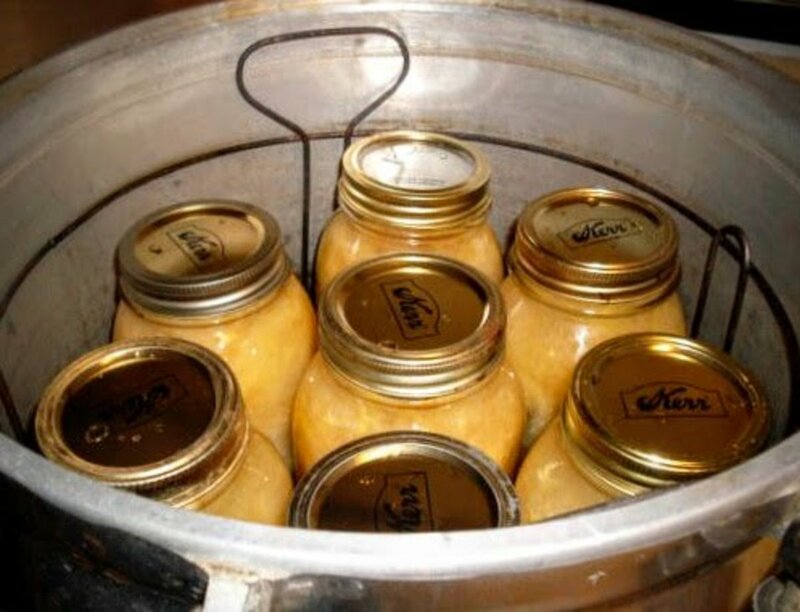 The truth is, if you wish to can your squash, you'd better borrow a pressure "canner" from someone, because most pressure "cookers" (small models designed for cooking meal-size amounts of food) are not designed to be used as canners. 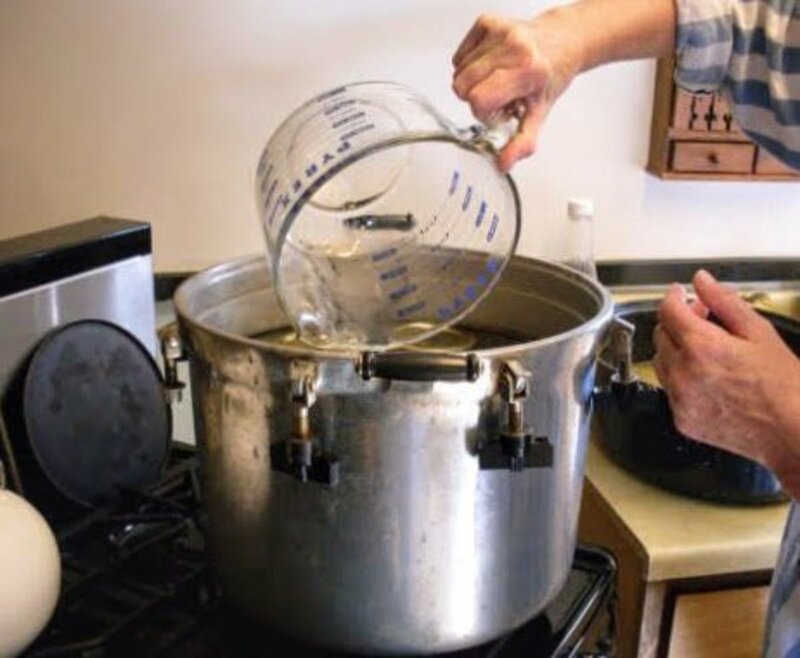 Of course, a pressure canner may be used to cook regular food without putting it in jars, but most often, a pressure cooker may not be used to can food. If nothing else, pressure cookers are usually too small. Check your owners manual to be sure of the safe uses of your particular model. I get very few complaints on the quality of my canning articles, or their procedures, so was surprised to see the problems this wording error has caused. I am truly sorry for your misunderstanding and troubles. I will fix the error in the article. I have been waiting for over a week for my comment to be posted and an answer to my question. So why is the reason why my comment is not being posted? you really don't explain how to use a pressure cooker to can squash at all yet your list of supplies says pressure canner/cooker. it would be nice if my question would actually get answered as I have squash coming out of my ears at this point and I don't want to take up any room in the freezer with it all canning it would be much easier. 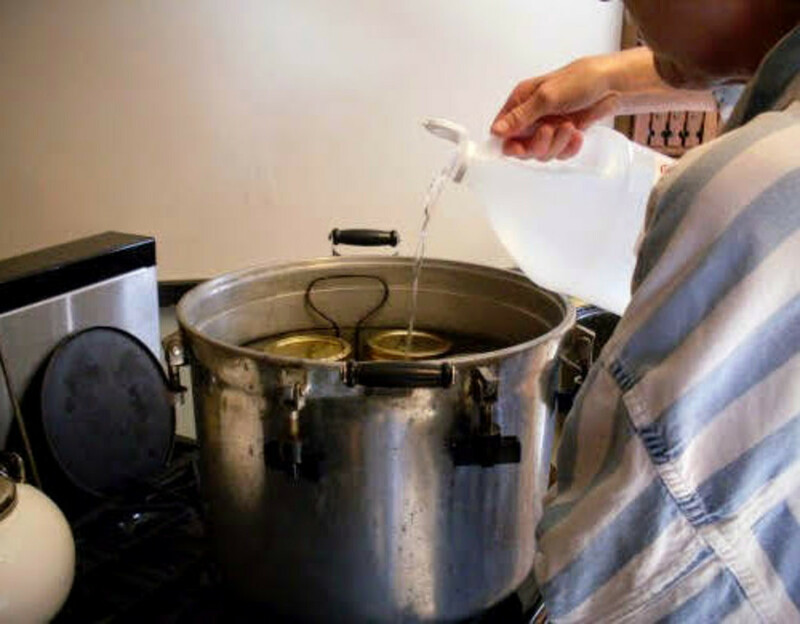 So again I ask how do you can squash with a pressure cooker? Judy, thank you for the lovely compliments! It is nice to hear from a fellow canner that the article was valuable. As to your question about frozen vs. canned spaghetti squash, I would do whatever is going to prove most convenient to you as far as fixing it for meals. 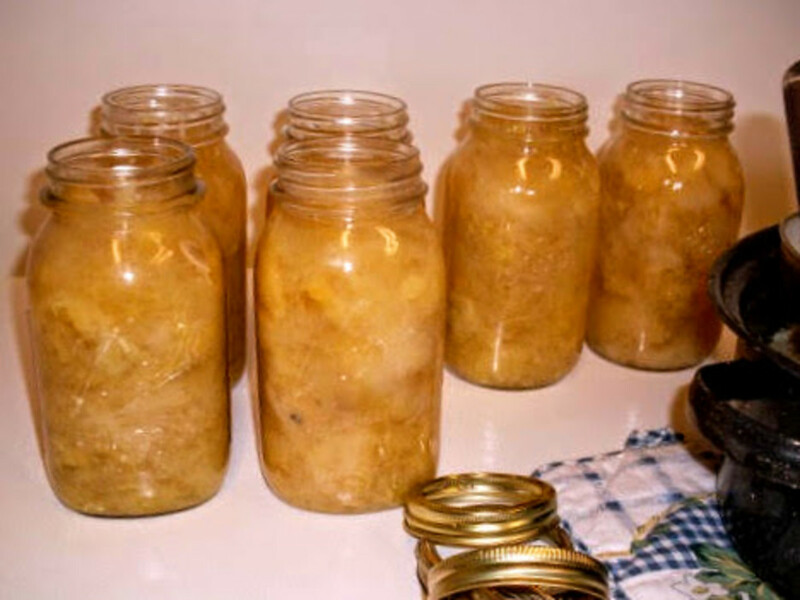 The truth is, it mushes up pretty badly both ways, due to the fibers getting broken down (I've tried both with almost all kinds of winter squashes, including spaghetti squash), and the main reason I canned mine was because of a lack of freezer room. On the other hand, canned squash is instantly available - no thawing time, and stays good a very long time without risk of freezer burn. So do what is best for your situation and available time (freezing being quicker than canning). Also, I apologize for not seeing your comment sooner! ButterflyWings, Have you ever frozen spag. squash? I'm wondering if, in your opinion, canned is better than frozen. First time planting spag. squash in my garden & I have 60 of them! Can't get my husband to eat it, so I want to preserve small amts for 1 person to eat 2 meals on. Not sure if I should can or freeze. Advice? I was able to farm out abt 20 of the squash but I hate to see the rest go to waste. Thanks for your opinion & for a great tutorial on how to can squash. Very well done! 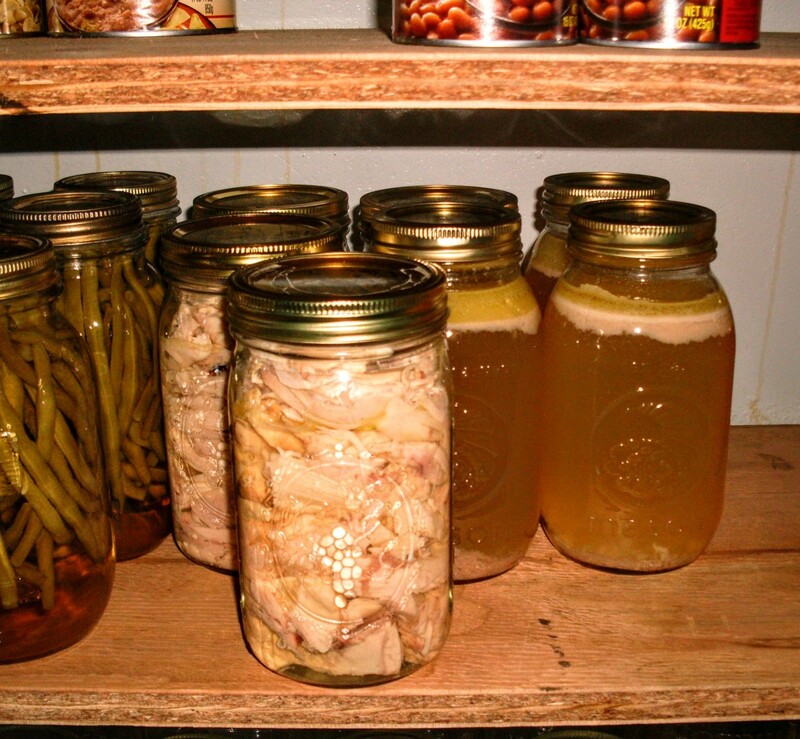 I have canned for years & this article was spot on & I was also very glad to see how much attention you paid to making sure safety was used around the pressure canner! Again, WELL DONE! LiftedUp, I, too, have stewed pumpkins rather than baking them, and didn't like the method near as well. Stewing is altogether messier, and I find it hard to judge how much water to use - it is easy to waste pumpkin pulp and flavor by using too much, and also easy to saturate the pumpkin pulp, meaning it has to cook down longer. However, if I had only a couple small pumpkins, I might consider stewing, depending on how cool the weather is and how fast I think I could stew the squashes in question. It is easy to get more weight into a large roaster than is easy to handle, so this, too, would be a reason to consider using a stock pot or something. 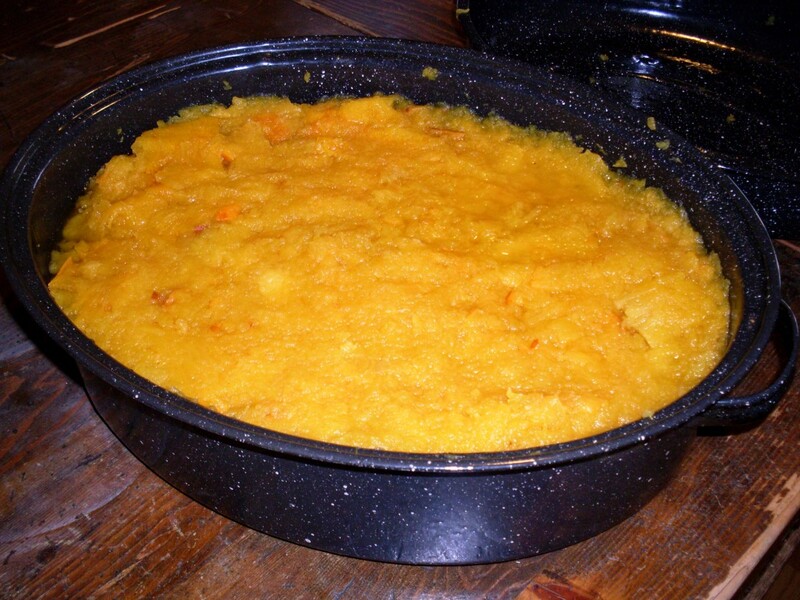 I havecanned my own pumpkin only once, and remember I cooked it in a pot on top of the stove that time. I remember, too, how it popped all over, and made spots here and there on the walls. It seems like I found and scrubbed those for weeks afterward! I definitely think the baking is a better deal. Thanks for all the pretty pictures. Well darn it! Now you've got me all hungry. I guess I'll have to get cooking for the fall now. Love the article. I'll have to give it a try sometime. Ivorwen, I love your avatar! It is beautiful. May your squash be large and numerous enough to feed your family and then some, in the coming years. I came in this morning to check this hub, as I realized I'd forgotten to put in the processing time (80 minutes), and then saw that my capsules had somehow gotten mixed up...I had to go to the bottom to find Step Five. Wow, sorry all. I guess I should wait a day after I think I'm done with an article before pushing "publish"! I don't like steam burns! My squash didn't get very large or numerous this year, but maybe next year I will need this. Bookmarked.